As anesthesia residents we are not taught an evidence-based method to secure peripheral intravascular catheters, whether arterial or venous. See one, do one, and teach one is the motto. Trainees and students are also challenged by teacher variability; the next person who comes along may teach you to do it differently. I have noticed multiple practitioners splitting 1-inch tape in half to apply below the hub of a newly inserted peripheral catheter and secure it in a criss-cross or chevron pattern. It is quite common for the operating room to be stocked with non-sterile tape rolls used for multiple patients. While we would hope and expect that grossly contaminated rolls of tape would be discarded, there are no existing practices or methods to ensure cleanliness, sterility, or prevent cross contamination. This observation led to my hypothesis that tape rolls may be a vector for cross contamination and resultant infection. The potential for this to occur would likely be increased in immunocompromised patients and/or those with long indwelling catheter times. There is sparse literature to address the infection potential of securing intravascular catheters in a non-sterile, criss-cross taping pattern. Studies have been done on central venous catheters since it is easier to track those patients in the intensive care units versus on the wards, where most individuals have peripheral intravenous catheters. As there are already standards for sterile preparation, draping, and securing of central venous catheters, the question remains why such precautions do not exist for peripheral catheters. I performed a preliminary survey of 200 health providers at a county hospital that included nurses, physicians, and other allied health professionals who start intravascular catheters. Sixty-seven percent of those surveyed reported that they initially used non-sterile tape on peripheral catheters followed by sterile, transparent medical dressing over the catheter/tape apparatus. Thus, I performed a small pilot bench study to evaluate bacterial contamination from 1) sterile, transparent medical dressing (i.e., 3M™ Tegaderm™ dressing), 2) unused (“new”), non-sterile, 1-inch surgical tape rolls, 3) previously used (“old”), non-sterile, 1-inch surgical tape rolls. 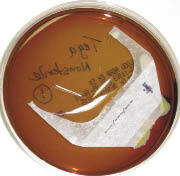 There were 2 arms to the study: a sterile setup and a non-sterile setup of tape onto sterile blood agar plates. For the sterile approach, there were 3 control plates, 3 plates with a half-piece of Tegaderm™ dressing, and 18 plates with pieces of tape from “old” and “new” non-sterile rolls. The pieces of tape were placed on the blood agar plates using alcohol and flame-sterilized forceps and scissors along with sterile gloves. The same setup was performed on another 24 plates but with a non-sterile approach without gloves, which represented the worst-case clinical scenario. All plates were observed daily while incubating at 37 degrees Celsius for 3 days. All controls showed no growth. 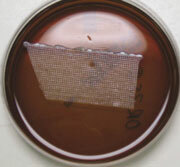 Overall, there was bacterial growth along nearly every piece of tape regardless of whether they were placed on the agar plates in a sterile or non-sterile manner. Yet, there was more growth with the “old” or previously used, non-sterile tape compared to the “new” tape. As expected, there was also more growth on the plates in the non-sterile setup arm compared to the sterile arm. It was also easy to detect the edges that were touched on the sterile Tegaderm™ dressings in the non-sterile arm by the localized growth. The photos in this article represent some of the growth with old and new rolls in the sterile and non-sterile arms of the study. 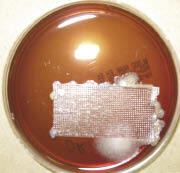 At least 14 of the agar plates were sent to our local microbiology lab for purposes of speciation. 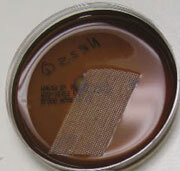 The following bacterial species were identified from the agar plates incubated with tape: coagulase-negative Staphylococcus, Micrococcus, Diphtheroids, Viridans streptococcus. There were also 3 plates that had fungal growth containing the Fusarium and Bipolaris species. Although some of these microbes are considered commensal, they have the potential to be pathogenic within immunocompromised patients. Although this is an informal small pilot study, it does raise a question. Why is non-sterile tape being used initially to secure a catheter hub at the patient’s fresh puncture wound? An additional non-sterile arm of the study using non-sterile gloves may demonstrate an intermediate level of growth between what was found in the sterile arm and the nonsterile arm with no gloves. Further detailed studies could reveal additional data that would likely support the pilot study findings. 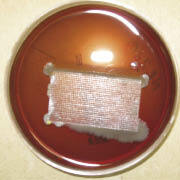 Figures A thru E with 3-day growth at 37 degrees C on agar plates innoculated with the following: (A) sterilely handled new tape roll; (B) sterilely handled old tape roll; (C) new tape handled with ungloved hand; (D) old tape roll handled with ungloved hand; (E) sterile tegaderm handled with ungloved hand. (1) clean hands and wear sterile or new, non-sterile gloves. (2) wipe the area with alcohol before and after placing the catheter. (3) place a transparent, sterile medical dressing over the catheter hub first. (4) place a longitudinal piece of tape extending from the skin just proximal to the medical dressing, over the medical dressing, and onto the IV tubing just distal to the catheter hub. (5) place the tape transversely as needed over the tubing. Unfortunately, utilizing the popular criss-cross taping technique could present the wound with potential pathogens if non-sterile tape is used initially. With all things considered, the above 5-step taping technique will not only help prevent the patient’s catheter from falling out, but it can potentially avoid infection at the puncture site.